ACT Late Models - Joey Becker had a good season in the American-Canadian Tour (ACT) Late Model division at Thunder Road, maybe his best one yet. A month shy of his 34th birthday, Becker is paving the way for Thunder Road’s “new breed” of Late Model talent. championship race at Thunder Road, and has placed himself among the elite Late Model title contenders. In fact, the effort was so surprising it went virtually unnoticed. ACT Quebec Series – The Best Western Hotel Universal in Drummondville, Qc. has been selected as the site where Série ACT Castrol champion Patrick Laperle and the top 15 competitors will receive their 2007 awards. The annual Banquet of Champions will take place on Saturday, November 17, 2007. Reservations are being accepted on a first-come, first-served basis according to availability. Tickets are $40 per person and must be purchased in advance from the American-Canadian Tour (ACT) offices in Waterbury, VT by Monday, October 29 deadline. Tickets are required to attend the Banquet and none will be sold at the door. championship, Laperle, who will take home $10,000, showed his versatility by carrying the checkers on a flat 4/10ths mile oval and a fast 5/8ths mile high banked speedplant. ARCA Trucks - Columbus, Ohio's Bill Withers climbed into his #57 Mannings USA-Hall Electronics Ford Ranger a bundle of nerves before the final event of the season at Toledo Speedway; but he climbed out all smiles after narrowly securing the 2007 ARCA Lincoln Welders Truck Series championship. The popular 50-year-old veteran edged Cleveland Ohio's Nick Gullatta by just 30 points en route to his second series crown. "I can't tell you how relieved I am," said Withers. "At the beginning of the race, we had backed up to 13th, and I knew we had to do better. But when you're trying to be conservative, and not wreck, that can be challenging. But this is the best feeling; I'm just so relieved. I'm going to enjoy this championship more than the first. And next year, we're coming back to do the same, and win some more races too." Withers built his championship season on the strength of consistency. In 13 starts, he only won once (Tyler County Speedway), but he had no DNF's and never finished out of the top-10. In addition, nine of his top-10 runs were top-five finishes. 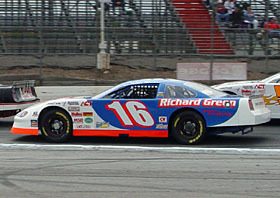 The 2007 title marks Withers' second career championship in the regionally touring series. He earned his first championship during the series' inaugural season in 1999 and is the only driver on the tour who has competed in every single ARCA Lincoln Welders Truck Series event, giving him 112 series starts overall. Withers also brought the title back to the Ford nameplate after Chevrolet dominated the most recent championship boards with drivers' Paul Hahn, Brett Rowe and Chad Guinn. Withers was also one of only two drivers on the circuit that utilized the Ford Ranger body combined with his Bud Wachholz-built Ford V-6 engine. Withers also kept the title in the family. His wife Leslie is the truck owner while his son Justin serves as crew chief. By contrast, Gullatta in Stan and Judi Rosen's #31 Thomson Automotive-Enerco-Mr. Heater Chevy S-10, posted three wins among seven top-five finishes and 10 top-10s. Despite motor trouble in the Anderson season-opener that left him with a DNF right out of the gate, Gullatta made a gallant charge toward the '07 title, finishing second for the second consecutive season. The numbers Becker spoke of initially were impressive: An opening-day victory at the Casella Mother’s Day event in May highlighted the year’s eight top-ten finishes and three top-fives in 14 starts, and a third-place showing in points was a career best. But the Jeffersonville, VT racer was right, the statistics were a little strange. In the same number of events in 2006, Becker posted two more finishes in both the top-five and top-ten, but still ranked only fifth overall. “I think the difference is that nobody had that outstanding, record-setting year this season,” Becker philosophized. And again, he’s right: Dave Whitcomb, with just six top-fives, led all drivers in the Late Model class at Thunder Road, and finished seventh in points. Pembroke’s title-winning season saw only five top-fives, as did Michaud’s runner-up campaign. Marcel Gravel and Kip Stockwell also earned five. By comparison, 2006 “King of the Road” Chad Wheeler had a whopping nine top-fives, as did Michaud the year before that. In 2004, Michaud had an even- better 10. Included on the list of DNQs at the Chittenden Milk Bowl were Trampas Demers and John Donahue – winners of the two most recent events at Thunder Road prior to the Milk Bowl. So, as far under the radar as he has been, how does Becker feel his team will stack up against the “headliners” in 2008? “We’re coming out fighting for the championship from day one,” he said. Given his quiet success throughout the past two seasons – say nothing of his sometimes dominant victories in the NAPA Tiger Sportsman division years ago – it seems like Becker knows how to do just that. Throughout the off season, the website will keep fans and teams up to date on plans for the 2008 season, including the upcoming Championship Banquet on Saturday, January 26, 2008 at the Kalahari Resort in Wisconsin Dells, WI. There will be an open practice on Friday,October 26 from 5 PM til' 9 PM for all divisions. ASA Northwest Tour - BJ Tidrick is the 2007 ASA Northwest Series Champion. Carquest Maritime Pro Stock Tour - Maritime Pro Stock Tour Limited declared Shawn Tucker of Fredericton, NB the 2007 CARQUEST Pro Stock Tour Champion. 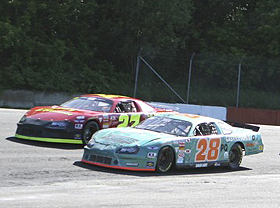 Tucker finished ahead of Shawn Turple and Wayne Smith in the standings after the 10-race season. “The Petty family’s ties to Nashville span four generations,” Mattioli said. “That’s impressive, and I want to make sure it’s never forgotten.” Lee Petty, Adam’s great-grandfather, raced at the historical Fairgrounds track during its early years, and was followed by fan favorite Richard. Adam’s dad, Kyle, also logged laps around the famed five-eights-mile oval. Adam had been in Nashville for a Busch race at the Superspeedway in Gladeville a month before his fatal crash. Talented, bright and charismatic, Adam was being groomed to carry on the legacy of NASCAR’s First Family when tragedy severed the racing lineage. Since his loss, the racing community has rallied around the Victory Junction Gang Camp, with NASCAR and many of its top drivers making contributions. Richard, whose 200 major-league victories stand as a record that will likely never be equaled, said Nashville was always a special place to him. Over the years it has lived up to its billing, with such celebrated champions as Darrell Waltrip, Rusty Wallace, Butch Lindley, Jeff Purvis, and many other prominent racers. ISCARS Dash Series - Johnny Chapman survived challenges from Danny Bagwell, Eric Wilson, Justin Hobgood, and the rest of the ISCARS field to win the Dukes of Hazzard Fans 150 at Hickory Motor Speedway (NC) recently. Joey Miller was second and closed in on points leader Danny Bagwell after Bagwell's problems late in the event. Randy Humphrey was third. Georgia Asphalt Series – Bubba Pollard won recently at Senoia Speedway (GA). Late Models - The annual season-ending Oktoberfest weekend at Lee USA Speedway attracted over 300 racecars to do battle in the ten-division extravaganza. In addition, fans and racers alike were treated to a variety special events throughout the weekend. The Late Models attracted a stellar field with entries from throughout New England, but nobody could stop 2007 Lee champion J.R. Baril from getting the job done once again. Baril recently announced his new ride for the ’08 campaign, taking over the driving duties in the Dave Reynolds entry. The team made their debut in fine fashion, as Baril made his way to the front in the early going, and was there to stay. Jeffrey Labrecque, Jr., another Lee regular, drove a steady race to grab runner-up honors, with Kris Lyman, Tom Fuller and Melvin Roberts finishing up the top five. Storm took the lead just after the 125 lap break, and held off Harris for the win by less than three feet. Nathan Buttke led all 30 cars in qualifying with a 15.346 lap in his Buttke's Dairy / Foster's Grille Pontiac. Storm was second quickest in his M & M Auto Sales Chevy with a 15.416 lap. On the initial start, Buttke jumped out in front and held the lead for a short period. 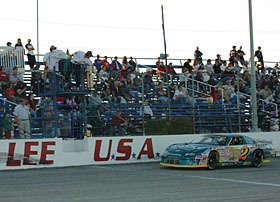 Michael Hardin, the Old Dominion Speedway 2007 Late Model track champion, pushed his Comfort Systems USA Chevy out in front and led until the mandatory 125 lap caution period and 10 minute break. Once the field took the green, Harris showed his strength and took the top spot. Storm, who had dropped back to as far as 12th, battled his way towards the front, and nudged his way into the lead entering turn one just before the 200 lap mark. He seemed to have things well in control, but his car began to have a bit of a handling problem, allowing Harris to make up some ground. CRA Super Series – The All-American 400 has always been a great race. Now it’s a great race for a great cause. Music City Motorplex president Joe Mattioli has designated the 25th annual race, Nov. 2-4, the Adam Petty Memorial All-American 400. The event will pay tribute to Adam, who lost his life in May of 2000 at age 19 in a crash at New Hampshire Speedway. The race also will promote the Victory Junction Gang Camp which Adam’s family established in his memory. The camp is free and available to youngsters who are battling life-threatening ailments. “This track has a tremendous history, and the Pettys are woven into that history,” said Mattioli, who has a tradition of recognizing and honoring the sport’s retired legends and other notable personalities. finally hit paydirt in the Late Model Sportsman main event, picking up his first win of the year after a series of early-race leaders fell out of contention. Eaton methodically picked his way to the front, cracking the top five shortly after halfway. The leaders tangled just a lap later, moving him to third behind Jimmy Renfrew and leader Kevin Aberle for the restart. Eaton quickly got past Renfrew and then slipped by Aberle into the lead with the laps winding down, and he survived a late-race restart to take down the checkers. Aberle wound up second, with Pete Jarek, Wayne Helliwell, Jr., and Renfrew the rest of the top five. Late Model Stock Cars - Dustin Storm from Prince Frederick Md. picked up the big payday Saturday night, holding off Stuart's Draft Va. native Chad Harris in the 250 lap "ODS Big One", the final Cowles Parkway Ford / NASCAR Whelen All American Series event for the 2007 season. drag raced to the finish line. But Storm's car came off of turn 4 a bit quicker, and the two drivers crossed the stripe just inches apart. Storm's win was by less than a .25 of a second. Craig Oliver came home third, while Rodney Cook and Bruce Stachitas rounded out the top five. The night also featured the return of legendary late model driver Wayne Patterson, who came home a respectable 8th spot after starting 24th. 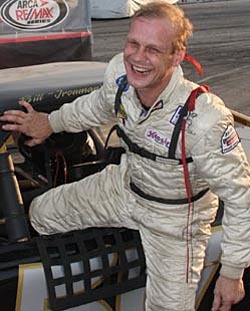 MAARA - Mark Bliss added his name to the 2007 list of Mid-Atlantic Asphalt Racing Alliance (MAARA) late model winners, by racing to a convincing victory in the 100-lap series finale Saturday evening, September, 15th at Lake Erie Speedway. 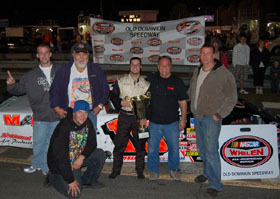 PASS Outlaw Late Models - Jimmy Rosenfield is the 2007 PASS Outlaw Late Model combination champion. 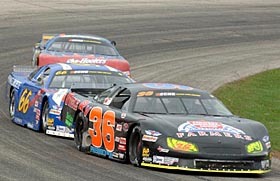 PASS North SLM – Ben Rowe is the 2007 PASS North champion. Click here for more. 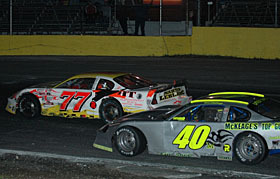 PASS South SLM – The Howler at Greenville-Pickens Speedway (SC) is set for this weekend. For all of the latest information about the race, please click here to visit the PASS South website. PASS Sportsmen – 2007 PASS Pullen Heavy Industries Sportsman champion Dan McKeage hopped into his Super Late Model and finished a strong second in the All Star Nationals open show at All-Star Speedway on Saturday night. McKeage was beat by PASS North SLM driver Scott Chubbuck. Sunbelt SLM – Race fans are in for a TREAT this Saturday night at New Smyrna Speedway when it is WINN DIXIE REWARD CARD NIGHT Sunoco Sunbelt Super Late Model 125. The "best of the best" Super Late Models will be on hand. It will also be Kids Halloween Costume Contest Night presented by Volusia County Fair. Big kids and little kids are welcome to dress your scariest to TRICK OR TREAT at New Smyrna Speedway. Also on the Saturday night program are the Pro Trucks, Sportsman, Super Stock, Mini Stock and Strictly Stocks. Pit gate will open at 2 pm with practice for the Sunoco Sunbelt Super Late Models alone from 3 to 4 pm. Division practice to follow. Qualifying for the 125 lap race will begin at 6:15 pm with racing action at 7:30 pm. Super Late Models – Scott Chubbuck won this weekend’s All-Star Nationals at All-Star Speedway (NH). UARA-STARS – Ross Furr took a hometown victory at Concord Motorsport Park. Wisconsin Challenge Series – Nathan Hassleau is the 2007 Wisconsin Challenge Series champion. ASA Late Model Challenge Series – Travis Dassow is the 2007 ASA Late Model Challenge Series champion. The young driver recently made his first NASCAR Craftsman Truck Series start at Martinsville, where he stayed out of trouble all day and finished 22nd. ASA Late Model North Series - 2006 ASALMS Northern Division Champion, 18-year-old Jesse Smith will close out his 2007 season in the Adam Petty Memorial / All-American 200 on Friday and Saturday November 2-3, 2007 at the Music City (TN) Motorplex in Nashville, Tennessee. ASA Late Model South Series – Beau Slocumb won Saturday night’s ASA LM Southern Division race at Hickory Motor Speedway. ASA Midwest Tour – Race fans who visit the ASA Kwik Trip Midwest Tour presented by Echo Outdoor Power Equipment’s website (www.asamidwesttour.com) will notice some changes on their next visit. The Tour along with website administrator Advantage Motorsports Marketing, are proud to introduce a revamped website.